Today for Slab Sunday we're looking at Verde San Francisco granite. Verde San Francisco is quarried in a bedrock quarry in Brazil. It is a green granite with darker green and black veining. There can be brown & rust colored veining and/ or spots in the stone. Most slabs have a dark red garnet in them as well. Verde San Francisco is also commonly known as Verde Maritaca. Other names include: Verde Maritaka, Verde Candeias, Verde Foresta, Verde Savana and Verde Kiwi. Below is an outdoor bench we installed a few years ago. This granite holds up great outdoors. The Verde San Francisco in the photo below has been honed. 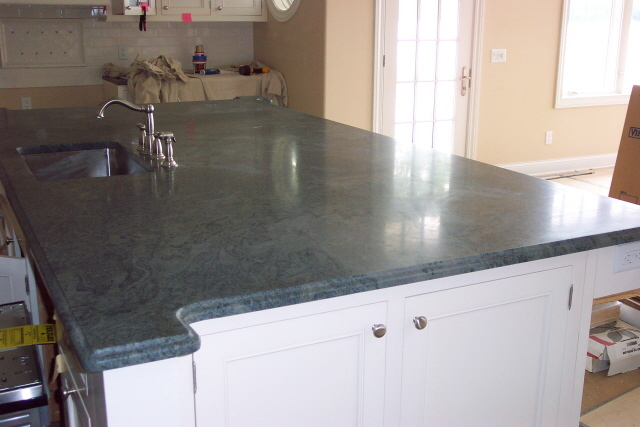 I really like this granite with a honed finish on it. Verde San Francisco is available in 2 cm and 3 cm slabs.